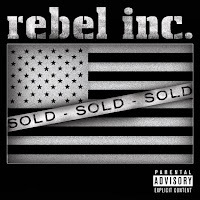 rebel inc. is an intensive live rock band formed on the outskirts of Detroit, Michigan. The founding members, Adam (Vocals) and Kevin (Guitar) have been writing the group's music since 2001 and have found new inspiration in the charm city. Kenny-Lee (Bass) is the only member of the band that is from the Baltimore area, B-Lock (Drums) also made the move from Detroit. They are known for their high energy live shows, intense political lyrics and powerful guitar rhythms. The resulting sound is a mixture of Rock, Rap, Alternative, Funk and Heavy Metal. They just released their first self-titled EP in March 2009 and the feedback from industry professionals and listeners alike has been very positive. The main release "909 Revolution" is getting airplay all across the US and even Australia, while other tracks are getting local and regional airplay as well. The group toured the US under the sponsorship of Iraq Veterans Against the War (IVAW) in 2008, who also sponsored Rage Against The Machine and The Flobots. rebel inc. is a must see live act, for their recordings do not capture the band's exploasive stage presence.